Some rooms seem to have drama built in, although it’s often difficult to determine how. Let’s take a look at this restaurant. The designer has managed to create a comfortable and inviting space without sacrificing drama and interest. It all starts with the flooring. 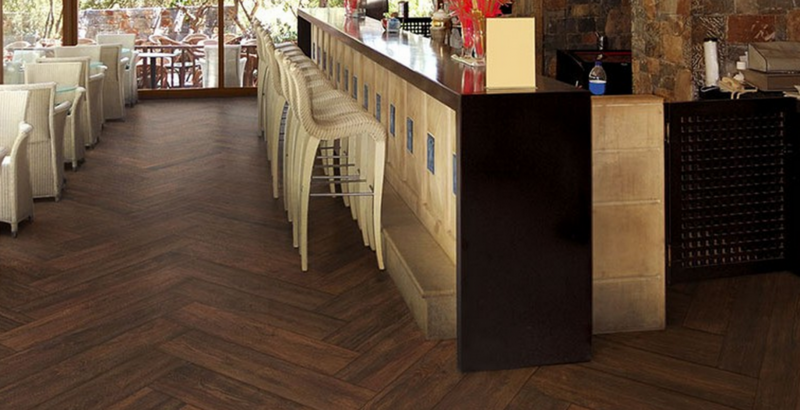 The dark-toned mahogany wood look tile in a wide plank is sturdy enough to handle traffic and frequent cleaning. However, the diagonal installation moves it from traditional to a more daring approach. The flow of this floor also encourages guests to pause and move to one of the seating areas. In contrast with this diagonal, the rest of the room marches down the length of the space. The straight bar, foot rests, stools and tables set the tone. Their style and rough white look establishes the room as part of its construction by reflecting the style of this well lit space. Stone walls and counter surface connect with the natural feeling of the space while establishing a contemporary tone. The simple modern rattan furniture and other elements work exceptionally well in tandem with the rich color and grain in the floor. The pattern variety combined with the understated neutrals of the remaining surfaces allows the look of the wood to stand out while not looking out of place. The simplicity of the rest of the décor lends a feeling of rich texture to every surface. Contrasting choices and a simple light diagonal flooring work together to make this space dramatic without being overbearing. Can you take advantage of a diagonal approach to your flooring or use variety in color and style as demonstrated in this room to create more drama and interest in your own home?